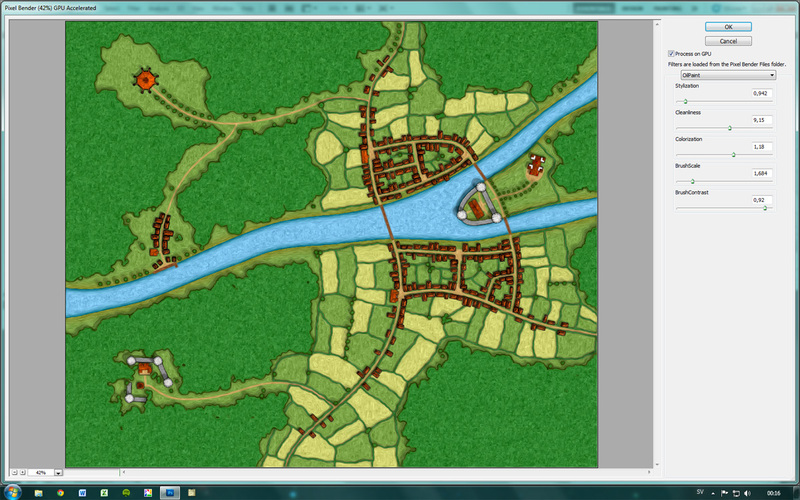 Now it’s time to continue with the map in Photoshop. To be able to complete the map in photoshop you must have CS4 or CS5. The reason for this is that you need a free plug-in from Adobe that is called Pixel Bender (you can download it from http://labs.adobe.com/technologies/pixelbenderplugin/). We need this plug-in to get the painting effect on the map. As you remember from last post you now have two pdf files, one with green grass/fields and one with yellow grass/fields. We are now going to combine these maps. Drag the yellow map/picture over to the green map/picture. You will now get two layers on top of each other. Lower the opacity on the top layer so you can get it exactly on top of the lower one. This is very important or the result will look strange. When that is done add a new layer mask to the top layer. 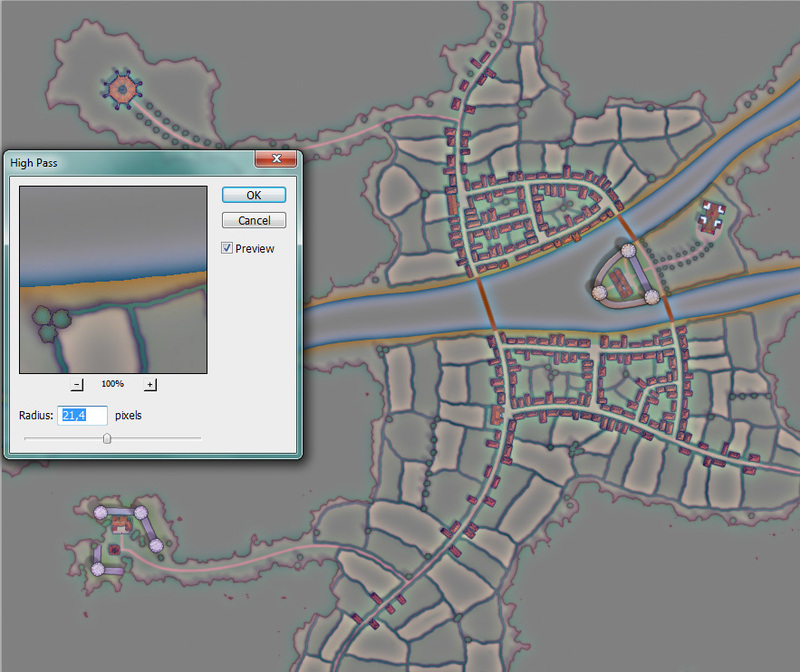 To add a Layer Mask click on the Add layer mask icon (down at the bottom of the layer window). This will add a mask filled with white (reveals all). Mark the layer mask and press ctrl+I, this will invert the mask to black (hides all). Now it is time to select the Brush tool (B). Select white as the colour you will use. Now draw on the fields you want yellow. All the drawing has to be done in the layer mask! Remember white will reveal and black will hide. In this way you can quite quickly get some nice fields that will alternate in green and yellow. 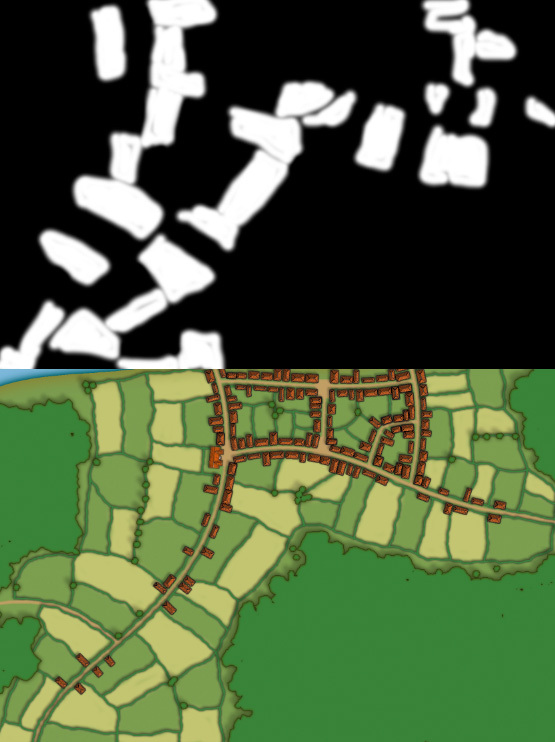 The picture below shows how the end result looks on part of the map and the same areas layermask. The next step is to get the painting effect. First of all you can flatten the image. Copy the layer two times, this will give you three layers with the background. Mark the middle layer, this will be the Pixel Bender layer. Select Pixel Bender, you will find it under the filter menu. In Pixel Bender click on the drop down menu and select the Oil paint filter. This will in a blink turn your map into an oil painting (this is really cool I think). When you are back in Photoshop’s main windows you can always adjust the Oil paint effect with the opacity setting of the layer. Try some different settings until you are satisfied. One of the drawbacks with the oil paint filter is that you loose some details, we’re going to fix that now. Select the third layer and select Other/High Pass from the filter menu. High pass will make your picture look grey and strange. Move the slider until your picture looks like it’s glowing with neon lights, like in the picture below. When you’re done click OK. Back in the main window you select the third layer again and change the layer setting from Normal to Overlay. This will give you the details back in the picture. Usually the effect gets a bit strong so it is always good to lower the opacity a bit to get the best result. The picture is at the moment quite bright in its colours so we have to fix that, but it has to wait until the next post. 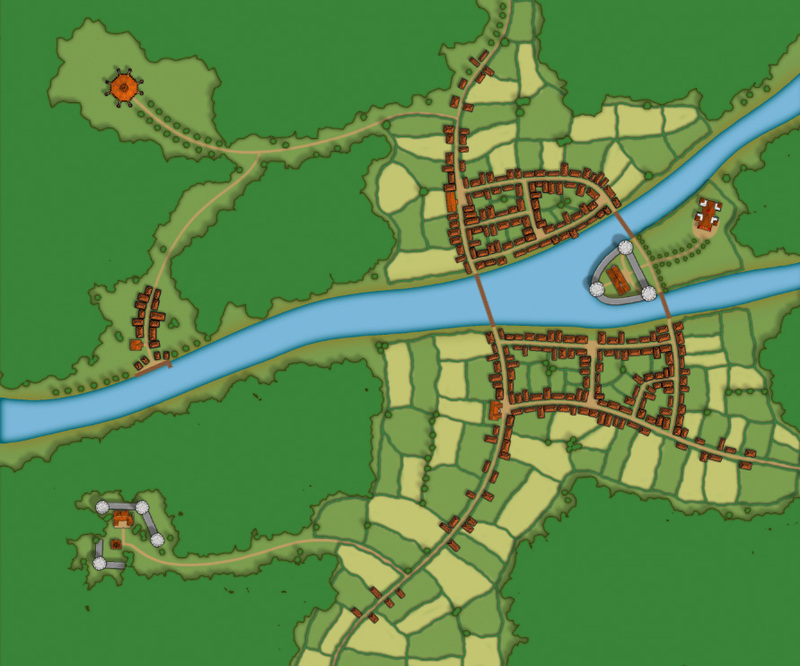 This entry was posted in Maps and tagged Photoshop, Town, Tutorial by clercon. Bookmark the permalink.